Radio has recently experienced a resurgence thanks in large part to the success that streaming technology is having in the music industry. As of 2017, streaming revenues made up 65 percent of music industry revenue in the United States, and radio providers have quickly begun to take advantage of the power of streaming through online radio offerings. 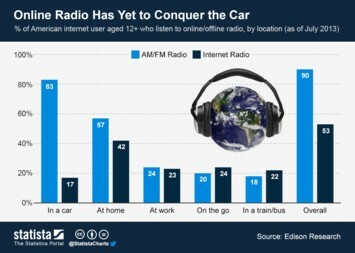 Forty-one percent of U.S. adults aged 18 to 49 report to have listened to internet radio within the past month, and online radio's share of total station revenue is increasing. American adults are tuning in to online radio for an average of 13 hours and 40 minutes every week. Forecasts suggest that 55.8 percent of the entire U.S. population and as much as 68.4 percent of the U.S. internet users will have become online radio users by 2018. The market leader in this industry is Spotify. Spotify Corporate has the highest number of average active sessions, consistently averaging over two million sessions. Its closest competitor is Pandora Corporate, which also consistently registers over two million sessions. Pandora makes a large share of its money from advertisements, in fact, the company makes around 7.6 U.S. dollars in revenue for each hundred listener hours. Due to the high proportion of the population that is reached by radio, advertisers are looking to capitalize on this market. In the United States, radio local digital ad revenue amounted to nearly 800 million U.S. dollars in 2018. Nevertheless, the figures are likely to grow in the near future, as the number of monthly digital radio listeners is expected to continue to increase.